I have the crud. AGAIN. This time from a friend's wedding this past weekend. This wretched allergy season has negatively impacted my immune system to the point where I can't go to a social function without catching a bug. Ugh. On a positive note, I was able to work in some miniature prep this past weekend. I put together Domina of Torment (Avatars of War), Fiama (Enigma), Wu Ling Shu (Bombshell) and a chibi Medusa that I'm not exactly sure where she's from. I also cleaned up Cheetah Girl (Reaper) that required no assembly. I ran out of super glue soon after that, though I was able to get them attached to the start of their bases. After that, it was off to the wedding. I received this key upon checking in. It's like they knew I was coming! I'll have to hang this by my painting table. Love it. Other than that, I redid my Twitter banner, which features the miniatures I've painted in the last year. The old banner was of miniatures I'd painted years ago and I figured it was time for a refresh. All but one of these (second from the right), I've painted in the last year and I'm super proud of them. 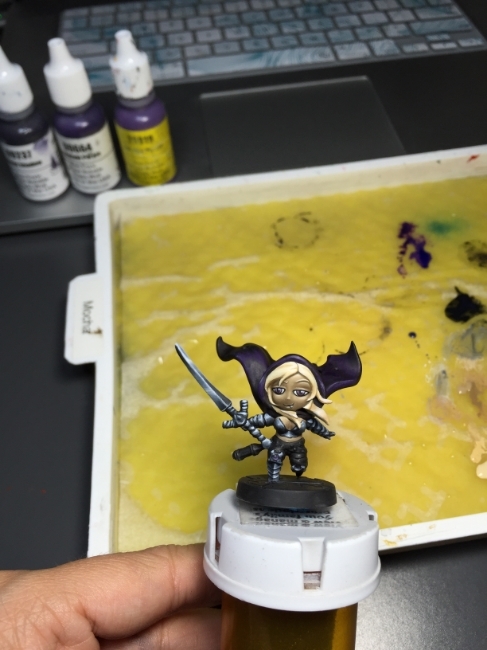 Not all went according to plan, but I learned a lot and I tried to get my hands on different types of miniatures– chibi, sci-fi, animals, dwarves, dudes, etc. Here's a closer look. While she won't match the creepy skintone of her larger counterpart, this little gyaru chibi will be in themes of purple too!